Mom is probably already expecting flowers and the regular suit from Khaadi , so what can you do to up the ante this year? There’s no point in asking her what she’d like because chances are her response will be, “I don’t need anything beta, just for my children to be happy” or if she’s one of those trained guilt experts, “Just to spend more time with my children”. But all jokes aside, Moms deserve to feel extra special with a truly thoughtful gift that they probably wouldn’t buy for themselves deeming it “unnecessary”. You know yours best so here are some ideas to choose from. The Politically Charged Mom: The Imran Khan kurta by Karma Nation showcased at PSFW 2013 has taken supporters by storm. If your Mom is voting PTI, this may just win her over and it’s available in all sorts of lovely colors and sizes. In fact you can buy them for the whole family and while you’re at it accessorize with Mahin Hussain’s limited edition Election bag as well which is available at Ensemble. The New Mom: The No.1 need of new Moms is space. Get her an oversize tote from Jafferjees or Charles & Keith to stuff the motherload of diapers and toys and have it inscribed for an added personal touch. The Fashion Savvy Mom: Stylish Moms are always fun to shop for as you can conveniently borrow everything later on, assuming you wear the same size of course. Your best bet would be the new Sana Safinaz (SS) Pret Store located at Dolmen Mall, Karachi. The sight of the luscious maroon SS shopping bag is sure to light up her face. Fill it with anything from SS cotton printed and kashmiri embroidered kurtas or their summer scarves and chic textured clutches. Chapal Obsessed Mom: If your Mom has a bit of a chapal fetish and wants one in every color, the Sana Safinaz store offers just the thing in a wide range of bright summer hues. For some accentuated ‘bling’, Zahra Habib’s new summer 2013 collection (available at Ensemble and Labels),is our favorite thus far and you can rest assured she won’t complain about them being uncomfortable in the slightest. 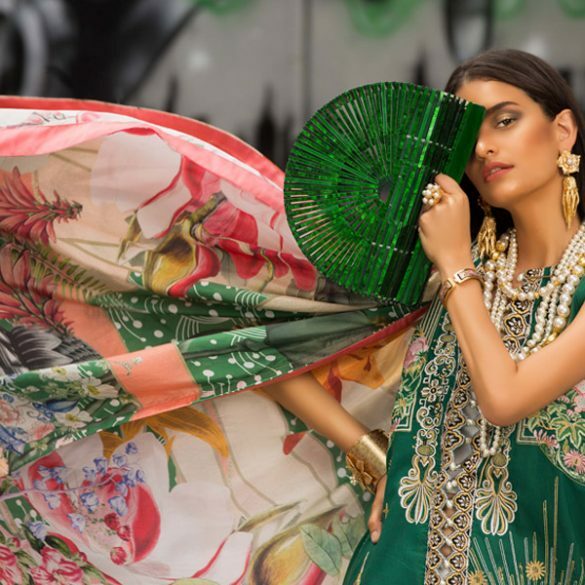 Classic Mom: We imagine the always well dressed lady-like Mom who loves her pearls and lunching with other Moms, would love a piece from Farah Talib Aziz’s (FTA) and Sania Maskatiya’s latest silk digital prints collection. While FTA prints scream pretty and feminine with the rush of being exclusive, Sania’s new Naksh and Ahghaaz line is on every woman’s wardrobe wish list. Work Mom: The 9 to 5 Mom may appreciate a more practical gift such as a nice leather monogrammed Ipad cover or Fashion Compassion’s rock studded zip up wallets from their eco-friendly label Gunas, designed to accommodate and compartmentalize her life while being super stylish and a great conversational piece. The Homemaker: The Mom who loves beautiful collectibles in her home could show off a fine China Breakfast Tea set. Present it by making a pot of tea for the both of you to enjoy on Mother’s Day morning and make it a monthly tradition. You can acquire a great set at Ensemble Home. The Foodie: For the Mom with a taste for the finer things in life, indulge her in a box of red velvet or chocolate cupcakes or treat her to a date at Lals Patisserie that is offering a special Hi-tea package consisting of their scrumptious macaroons and mouth watering desserts for the day. The Out Door Mom: Does your Mom enjoy an early morning breakfast with her newspaper or a book in the garden? If yes then investing in some wicker patio furniture from Baahir might be a splendid idea. Finally if you want to go all out to make the most important woman in your life feel special no matter what her interests, you can invest in truly memorable Mother’s Day collectible jewels by Kiran Fine Jewelry, exclusively designed in pink Sapphires and Rose Quartz to mark the occasion. The valuable pieces can be passed on for generations to cherish the incomprehensible bond between mother and child. Happy Mother’s Day to All!